Sick and tired of being sick and tired? An alternative medicine approach may be just what you've been looking for! Our detailed report of findings gives you the details of the holistic medicine program customized for you from your lab findings. Don't give up hope! Find the answers you have been looking for. We're here to help! ​If what you've been doing has not been working for you, maybe it's time for an alternative approach. We offer holistic solutions to chronic illnesses. We look for the root of the problem, and we KEEP LOOKING if we need to until we get you on the path to better health. ​We are often shocked by the limited panels run by other providers. No wonder labs often are "normal" but you're still feeling sick - it's hard to catch something if you're not looking for it. There can be several explanations for your symptoms, and we look for them all. We run a comprehensive series of tests to get to the root of your symptoms. There can be several reasons you are experiencing the symptoms you have, and since we take a "whole person" approach, things don't get missed. Your blood work never lies! We use scientific and objective blood tests, hair analysis, stool, and urinalysis to thoroughly evaluate your health status. 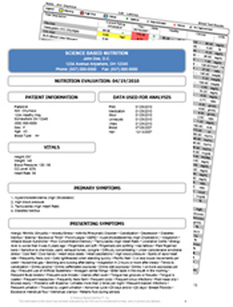 We couple this with the patented Science Based Nutrition™ software to generate a complete 15+ page, easy-to-read report of findings and individualized, drug-free treatment plan. Click here to see Case Studies of successes with Science Based Nutrition. If you are ready to start your journey back to health, please call or schedule your visit with us. Once your visit is scheduled, we will email or send you your paperwork. This needs to be back to us (by email or mail) before your appointment so Dr. Welch has time to review it and prepare for your consultation. Please come FASTING to your appointment, as we will likely refer you to LabCorp for testing so you can get started right away.​​ We HIGHLY encourage you to bring your spouse or partner with you to your consultation so he/she can hear first hand what the plan will be and so you can have his/her full support. After your results are all in, we will contact you to schedule your follow-up. This is when we will go over your results and our next steps. Depending on the tests we run, your results will all be back from a few days to a few weeks' time. Once you get started with our recommendations, we want to be sure it's WORKING for you. We don't want you to spend your time, energy, and money on things that aren't doing their job. We often will order a follow-up run of labs after just 8 weeks on the program to be sure you're getting the results you are ​seeking.